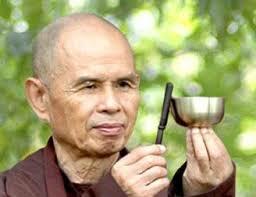 Thich Nhat Hanh was coming to the Omega House in upstate New York. It was the late 1990’s and I hadn’t a spare penny to even consider the journey. 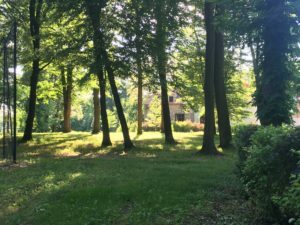 A week with Thich Nhat Hanh though; I dreamed of such a retreat. To my amazement, the meditation teacher at the Jung Center Houston offered to pay for my plane fare and then a few extra dollars for travel. I was as much surprised as I was grateful for my good fortune. These were the days before on-line registration so everything had to be done by phone and written application; a bit more onerous than it is today. I reserved a tent because I couldn’t afford even the dormitory style units. (It never occurred to me that I didn’t even know how to set up a tent and had only been camping a few times previously with experienced campers). All I could think about was meditating in the same room with Hanh. Peace in every step of my pilgrimage toward him. I arrived at this oasis of paradise, The Omega House, by plane, bus, cab and foot. Once at the registration desk, I was handed my tent and a map. I was completely out of my comfort zone as I don’t read maps well. Okay, not at all. Struggling with an oversized backpack, a map, and a tent, along the way passers- by were quick to point the way and offer help. Finally, I gave way in a heap at the designated location for campers. In the full warmth of the sun, I opened the instruction packet on how to erect my tent. As you can imagine, it didn’t go well until more sympathetic on lookers decided to come to the rescue. The week was a medley of calamities such as keeping as dry as one can in a tent during a down pour as the storm advances across the lake toward you and the absolute serenity of mediating with Thich Nhat Hanh. The experience has been a shaping influence on my spiritual path, just watching this mindful monk, slight in build, simply dressed, walk across the floor with such great attention like I’ve never seen before or sense was worth every step of the way there and then home again. Next month I am boarding a bus, catching a plane and then taking a taxi to see another wisdom teacher, this time in London. Christopher Bache, author of Dark Night, Early Dawn deserves my presence. Yes, I have seen his lectures on YouTube, read his books and listened to his radio interviews but to hear his voice in the same room in which I am sitting, to have the physical experience of sound and resonance within a shared space is an essential ingredient of sacred travel or pilgrimages we make to the shamans in our midst. The internet is a marvellous tool, but nothing can replace the packing of a bag, the anticipation of an experience and then the arrival of the actual adventure. Consider movement, consider the crossing. Dream Tending in Poland, September 27 – October 1.